I'm hoping someone could help answer a question for me. Top Cat arrived Wednesday and once I got it into the shop I started looking the car over. One of the first things I noticed is a set of numbers that appears above VIN # in the cut out VIN area like what would be seen on a 1967 fender. I asked Don Rush and he brought up a good point about the fender Vin cut out. He asked if it was a 1967 fender that was cut to accept the 1968 marker light. I will have to get out to the shop and check this later. This photo is on the drivers side fender apron and the lower number matches the door tag and windshield VIN plate. I'm not sure what the other numbers above the VIN mean? Does anyone have an idea? Numbers above VIN # ? I found this post on a Mustang Forum. Here is the quoted text and a link. "I used to own a totally legit early KR convertible, with all of its original tags, known history, and no accident damage. 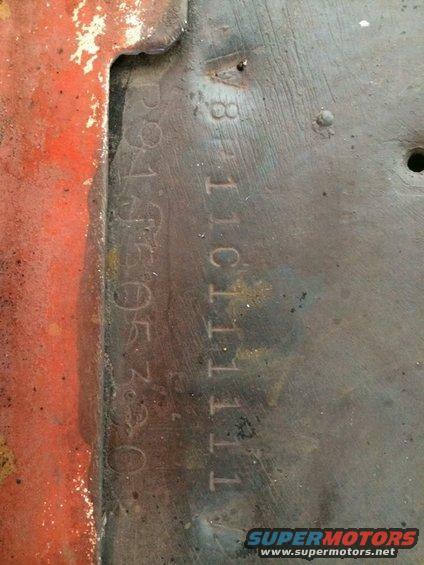 The original Ford VIN stamping on both sides of the fender aprons (under the fenders & under the Shelby VIN tag) read "8T11C111111". Made no sense at all." It sounds very similar to what I have except for the T my numbers appear to have a P.
Last edited by 1967 S Code on 31 Jul 2017, 12:13, edited 1 time in total. The number looks like 8R11C111111 to me. The font on that VIN is consistent with original cars. That number is from a Ford though. There is no body code of "11", so it is either a miss-stamp, or maybe practice? The lower VIN with larger numbers does not look like the font that Ford used (in size or style) for the aprons. It looks closer in style to what was used on the plates riveted to passenger side dash, visible through the windshield. CougarCJ wrote: The number looks like 8R11C111111 to me. The font on that VIN is consistent with original cars. That number is from a Ford though. There is no body code of "11", so it is either a miss-stamp, or maybe practice? Thanks Scott. I agree the font on the vin # looks extremely close to the font on the window vin tag. When the fenders come off I'll check the passenger side to see if the same markings are there. Overall it's kind of weird but like the post on the Mustang forum, it seems not to make any sense at all. Here is a video that was taken the morning before Top Cat was loaded on the transport. Maybe service replacement panels had that as a generic vin. Or maybe it was to identify experimental factory convertibles... On my 68, the vin is stamped too far outboard to even show up in the fender notch. I can see it in reverse from the bottom side. Yeah that's what I was thinking, experimental factory convertibles that have to be finished 46 years later. Here is an example of a mis-stamp that I found on a Mustang. My guess is that the previous car to be stamped was a Cougar, and they forgot to change the "9" to a zero. 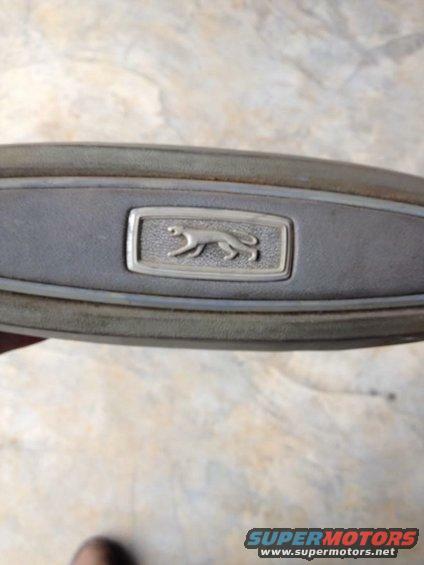 How do you remove the center padded section and the walking Cougar emblem from the steering wheel pad? Last edited by 1967 S Code on 31 Jul 2017, 12:22, edited 1 time in total. Yorgle wrote: Maybe service replacement panels had that as a generic vin. Or maybe it was to identify experimental factory convertibles... On my 68, the vin is stamped too far outboard to even show up in the fender notch. I can see it in reverse from the bottom side. As I recall the center piece is just pressed into place. There is a long stud coming off the backside of the piece on each side that fits into a hole in the foam of the main pad. If you have the main pad removed from the steering wheel you can sometimes see the hole from the underside and can then use something like a punch to help push the studs out. If not gently pry from the topside. Either way try to work each side evenly. Once the center piece is removed from the pad I believe that you will need to do a little grinding to remove the Cougar emblem. If you have purchased the reproduction center piece you will see where the studs are on the backside.